Organisations can expand the data being protected, improve recoverability, and speed up recovery times – all while lowering the cost. The adoption of cloud IT services by small and mid-sized businesses (SMBs) is increasing at an exponential rate. But despite the robust adoption rates and proven track record of cloud technology, many organisations of all sizes, including SMBs, are still relying on on-premises backup methods. By doing so they may very well be draining themselves of valuable resources, including financial resources. This article discusses the specific ways in which these organisations that continue to rely on on-premises instead of cloud backups are costing themselves money. It discusses benefits of adopting the cloud backup model, and addresses common concerns and misconceptions IT and business professionals often mention as reasons for staying with on-premises backups instead of adopting the cloud. According to the results of our World Backup Day 2017: State of the Backup survey, 51 per cent of business users within organisations back up their data to on-premises computers or external drives and only 35 per cent back up their data to the cloud. Why do so many continue to choose an on-premises solution? In an effort to keep business operations running smoothly and uninterrupted, companies often want to stay with what they are most familiar and comfortable – so they default to it. They fear the unknown. On-premises is an established, familiar and comfortable IT model. But adhering to this increasingly antiquated backup method results in substantial, often “hidden” costs and a subsequent loss of ROI. Some of these unnecessary costs include the cost of implementing, maintaining, and supporting backup hardware and software. But the cost is even greater than that. In many organisations, the cost of backups may seem so high they are simply pushed aside. Over one-quarter (28 per cent) of organisations surveyed don’t even perform daily backups of their data. Even with the burden of time and resources to be devoted to backups, there simply is no excuse in today’s world for not having frequent backups. Only 21 per cent of organisations back up critical customer data. This situation can happen because of the constraints of inadequate on-premises storage or other IT resources. Remember, your data is the lifeblood of your organisation! Should you be one of those organisations that perform no backups of your data at all, a single loss of data could put you out of business – regulatory and compliance problems, lawsuits, lost customers, and poor publicity resulting in brand and reputation damage for the company can all result. And should a recovery event occur, on-premises backups can limit your recovery options around where, how, and how quickly recovery can take place. The simple local backups demonstrated in the survey data only facilitate a local recovery of the data. In circumstances where local machines – or even the local office – are wiped out, there is little recovery that can be done. This makes the threat of data loss somewhat significant. But, does data loss even happen… ever? Twenty-eight per cent of those surveyed indicated that they had lost data multiple times, making the prospect of data loss not just possible, but probable. And, depending on the data, application, or system lost, recovery can involve substantial expenditures for any organisation – not just a large enterprise, but for SMBs as well. Even in a routine restoration situation, restoring data from tapes or old media using antiquated backup systems can be very time-consuming and inefficient, further draining an organisation’s financial resources. Then how does the cloud help? Cloud backups substantially reduce the financial outlays organisations that currently rely on on-premises backups; reductions in capital expenditures, utility costs and IT staffing expenses can all be realised from a switch to cloud backups. SMBs frequently have work-related documents they need to be highly available and quickly and easily restorable. The survey results indicate that nearly one-third (29 per cent) of respondents do not back up these critical documents. Cloud backups would not only provide much-needed protection for them, but would make the restoration process simple compared to the typical on-premises backup system. 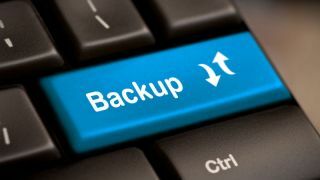 A proven best practice is to follow the 3-2-1 Backup Rule (3 copies of your data, use of 2 mediums, 1 copy to remain offsite) to keep business data readily available. But according to the survey, only 14 per cent of business users do so. This backup rule exists to ensure an ability to recover – no matter the disaster. So, it should come as no surprise that an outdated on-premises backup methodology provides less recoverability. Use of Public Cloud storage additionally lowers the on-going and overall costs of backup and recovery, while improving data integrity and availability in an organisation’s time of need. Matched with a backup and restoration specialist with expertise to assist an organisation in the planning and execution of a recovery strategy, with world-class backup and restoration capabilities at their disposal, makes data loss much less likely, and restoration often much quicker. So with all of the reasons to choose a cloud backup solution, why would SMBs continue to select the on-premises route? Why are so many hesitant to adopt cloud backup? The term “cloud”, in and of itself, seems mysterious and hard to grasp, to many. But business and IT professionals should not think of the cloud as a nebulous, hard-to-define concept, but rather as a world-class data centre they can access quickly and conveniently through the Internet, a valuable resource that can help make their jobs easier. According to the survey, the primary reasons organisations shy away from cloud backup are concerns around security (59 per cent). However, security is a top priority for cloud backup vendors. Features such as encryption at-rest and in-motion, state-of-the-art data centres utilising surveillance and physical access security, accessibility to data by the customer only, and data sovereignty are but a few of the security measures taken by cloud backup vendors today. It’s evident that many organisations still remain in an on-premises mentality towards their backup efforts. But with the need for businesses to remain operational just to remain competitive in today’s market, now is the time to look for backup and recovery options that align with the needs of the business. From the data shown in the World Backup Day 2017: State of the Backup survey, many organisations remain entrenched in their old ways. This is not only detrimental to data recoverability, but also to the livelihood of the organisation as a whole. By embracing cloud backup, organisations expand the data being protected, improve recoverability, and speed up recovery times – all while lowering the cost of backup.